With Windows XP Media Centre Edition installed, the Evesham Quest A240 (£499 inc. VAT) provides basic multimedia ability, but performance is limited. Weighing 2.7kg, this is a reasonably lightweight laptop. Ultraportable laptops are almost impossible to find at this price point, so the Evesham is an adequate compromise. Unfortunately, its 146-minute battery life is below the three hours we expect. Build quality is strong and protects against damage on the move. The user interface is well designed, but not flawless. Despite responsive keys, the keyboard has a sharp typing action, which can make speed-typing uncomfortable. Day-to-day use is made easier by media keys along each side of the keyboard. Allowing one-click access to word processing, internet and email software, your most common tools are instantly accessible. 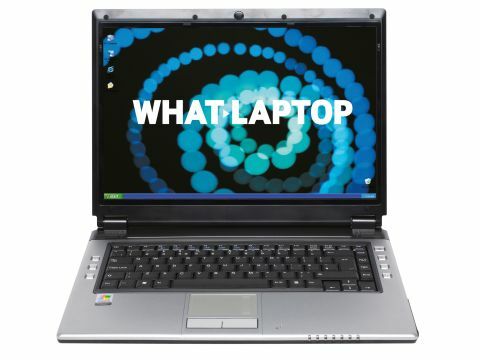 Common for a budget laptop, the 15.4-inch screen has no glossy Super-TFT coating. Although not as bright as the best around, colours are still vibrant. The 1280 x 800-pixel resolution is average, but is sharp and great for watching movies and viewing digital photos. As expected, 3D performance is low. Using an integrated Nvidia graphics chip, anything more than basic gaming is out of the question. There's enough power for basic photo and video editing, so this won't restrict home or office use. Using an entry-level Sempron processor from AMD, performance is basic. While fine for standard tasks, such as writing letters and browsing the internet, the system slowed down to a crawl when we tried editing photos while simultaneously running a virus scanner. If your needs are simple, it will be fine, but it makes you wonder why MCE has been installed. With its Media Center operating system, you can use the Evesham as a one-stop hub for your photos, songs and videos. However, with no remote control and a fairly small screen, it's better used at a desk than as a living room Media Center. For sharing files with external hardware, such as digital cameras and PDAs, a 3-in-1 card reader is fitted on the right side of the chassis. First-time buyers won't need to add any new software. Microsoft Works provides a range of home applications, and BullGuard Internet Security keeps you safe online.